Brand new sunburst style Monstrance plated in silver and gold. 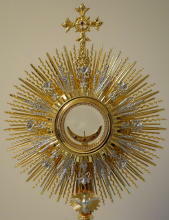 The Monstrance is in ornate sunburst style with a decorative knop and base. 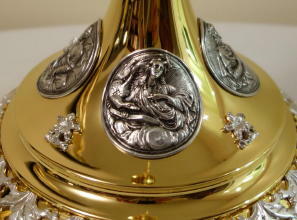 The centre-piece has gilded rays overlaid with silver plated sheaves of wheat and cherub heads. 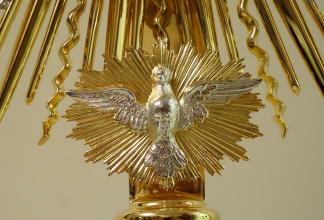 At the base of the sunburst design is a Holy Spirit image surrounded with rays. 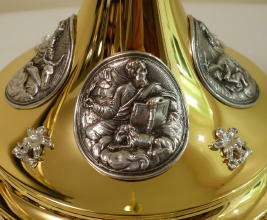 The circular base has silver plated roundels of the four Evangelists. The height is 69.5cm and the diameter across the sunburst part is 35cm. The base diameter is 23.5cm. The lunette is finished with decorative stones and has a diameter of just over 6.5cm. 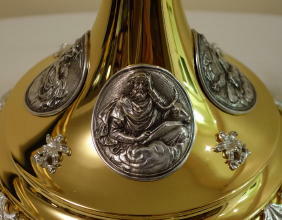 The Monstrance comes complete with a matching Pyx into which the Lunette will also fit. 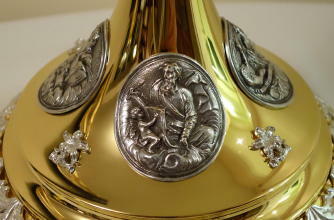 The pyx is gold plated with a silver plated Agnus Dei worked on the front. 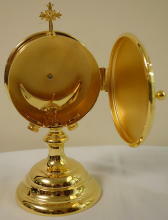 The height of the Pyx is 21cm. 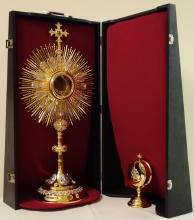 The Monstrance comes complete with a fully lined, fitted case. This Monstrance is available to order, price £3,250.